Location: Near Trollstigen, Romsdal, Norway. Climbed July 2 2009 and October 18. 2015. 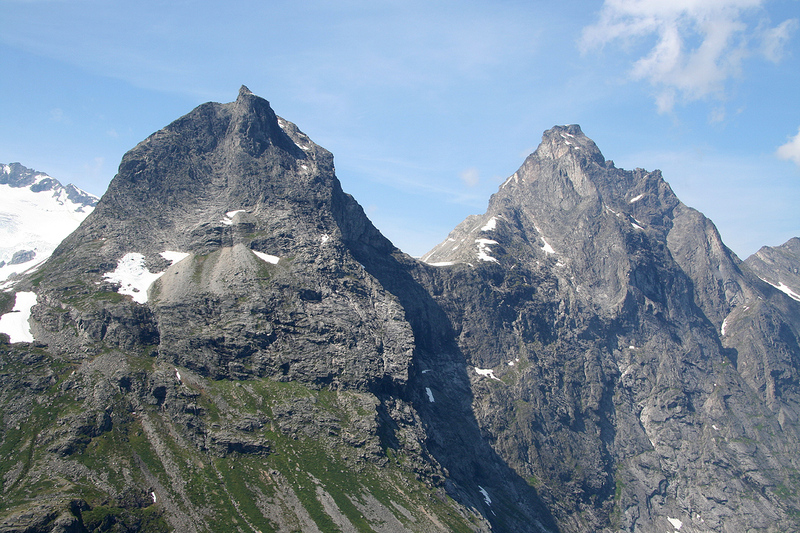 How to get there: This mountain is slightly higher than the jagged peaks that form the top of the famous Troll Wall, one of the highest vertical cliffs in Europe. Breitinden is just on the south end and unlike the spires to the north, this mountain is broad and massive. 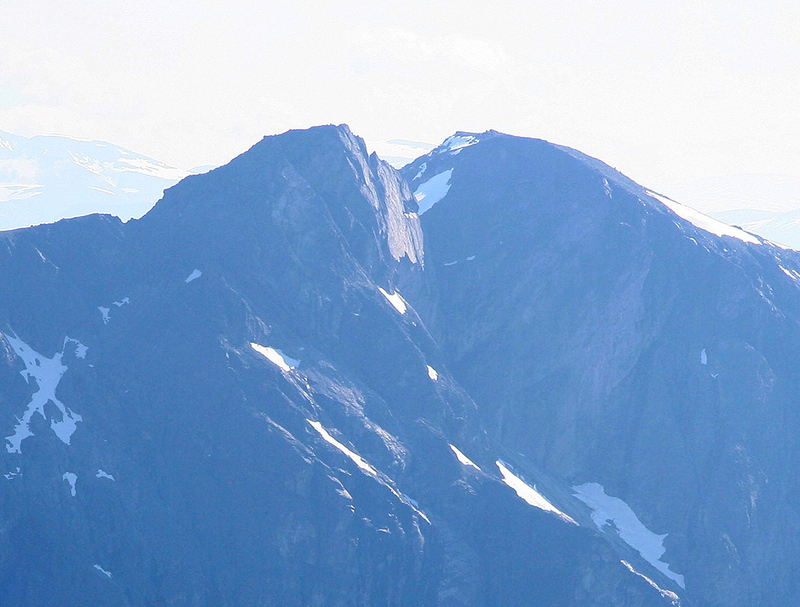 The nearest village is Åndalsnes. Åndalsnes is located at the end of the valley Romsdalen, connected to Hwy. E-6 via Hwy. E-136 from Dombås. The best access is via Hwy. 63. Hwy. 63 forks south from E-136 about 5 kilometer south-east of Åndalsnes. 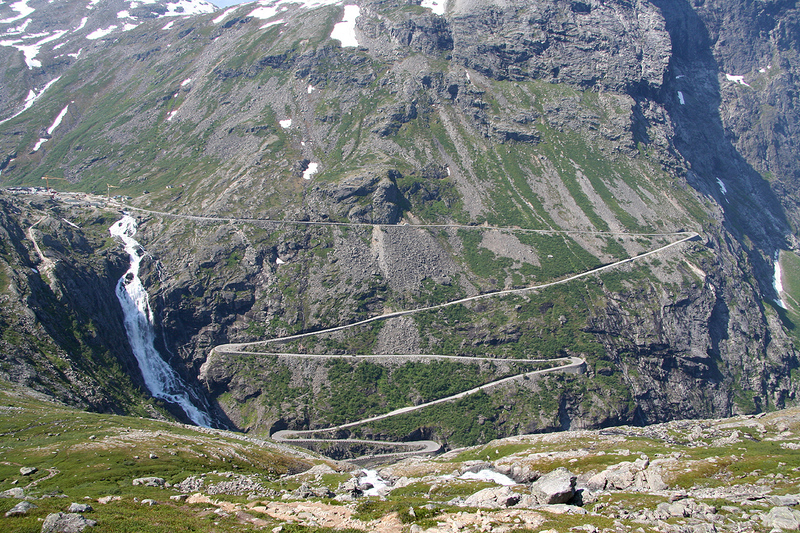 This road is famous for its section Trollstigen, a spectacular hairpin-curve road that climbs a steep mountain slope with postcard quality waterfalls all around. Drive up this road to the top of Trollstigen. There is quite a tourist development there and plenty of parking. Note that this road is winter closed until the end of May. The trailhead location is N62:27.181, E007:39.789, elevation about 700 meter. Park here. 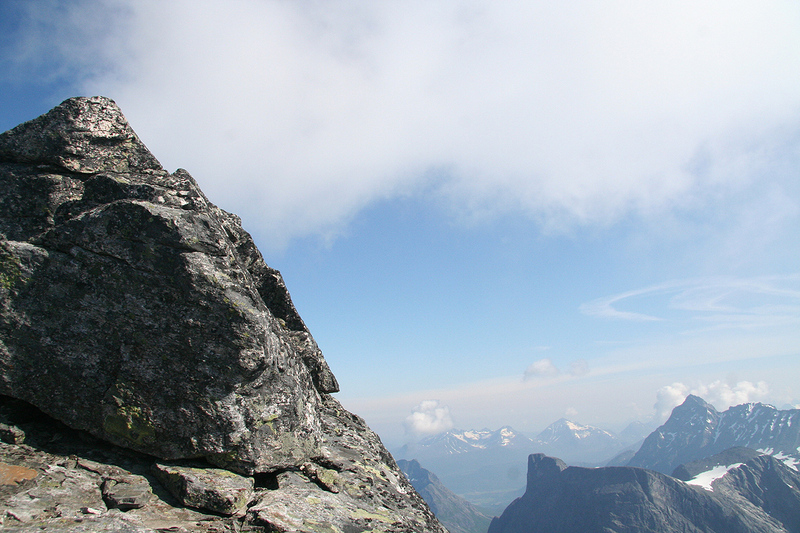 Route description: From the large parking area at the top of Trollstigen, cross the river and head east along a paved trail that serves a viewing platform further ahead. Do not follow this trail for very long, look for a passage that traverses up to your right. People have built a small "cairn forest" in this area. You will reach a huge cairn, then follow the clear trail as it climbs into the small valley containing Stigbotnvatnet (984m), then climbs the somewhat steeper hillside in order to gain the base of the north-west ridge coming down from Breitinden. Leave the trail here and head up this ridge. 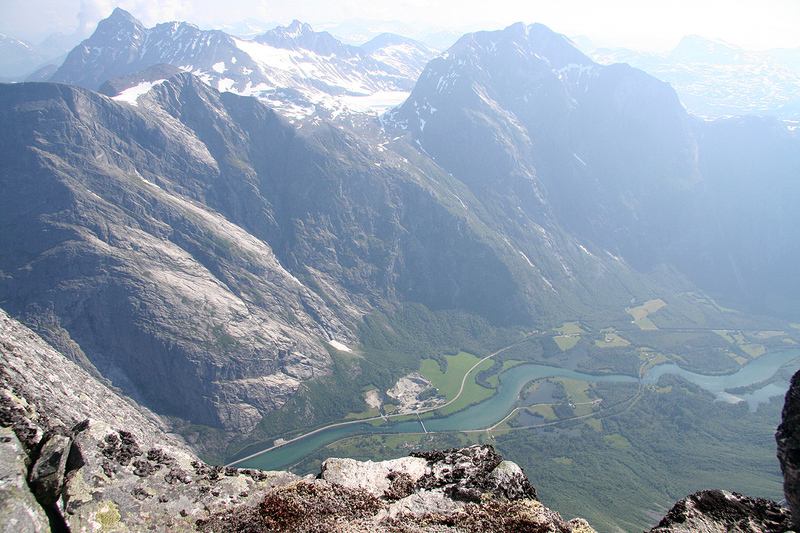 (The trail continues to a viewpoint at 1536 meter overlooking the Romsdalen valley. This ridge is nice and the scrambling gets better the higher you get. The rock is good and the difficulty stays at YDS class 2+, perhaps a few class 3 moves if staying exactly on the ridge. By staying slightly right in a few places one can most likely limit the ascent to class 2. 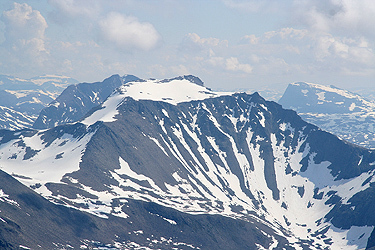 This ridge tops out at a small plateau that again connects to a final uphill slope full of large boulders. At the top of this slope, you traverse a very gentle (and pretty large) snowfield before a short final scramble to the rock summit of Breitinden. The "world ends here", the top ridge is very distinct and clear, the next thing you see is the valley floor, about 1600 vertical meter below. One may prefer to descend the north slope instead of returning along the ridge. This snow slope is, however, quite steep and one should carry an ice axe if attempting this in July or later. Comments: I did this trip with my son Pål Jørgen, age 20. We needed to drive all the way back to Bergen, this called for an early start. Thus, we were parked at the Trollstigen "tourist trap" already by 0630. A quick breakfast, still slicing our bread with a pair of scissors, and we were ready to hike by 0650. A lot of ugly construction work made us detour left before finding a paved ! trail sloping slightly downward, but heading in the correct diection. We both agreed that a dirt trail had been more appropriate, this trail was clearly designed for tourists that could only walk on pavement. Soon, we dscovered that the trail led to a viewing platform and that it dead-ended there. Obviously, our trail had to be somewhere above us (there were no alternatives!). Climbing more or less straight up, we immediately found ourselves in pretty steep class 3 terrain, in fact the steepest climbing of the hike. Soon, we arrived at a gigantic cairn and a pretty big trail leading onwards towards Stigbotnvatnet, 984 m.
The hike was now quite easy, we followed the trail that runs all the way to a viewpoint at 1536 meter north of Breitinden. 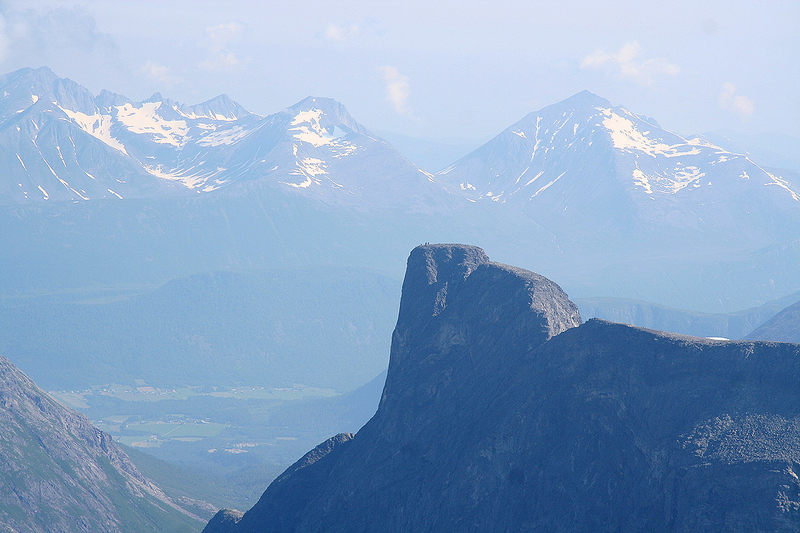 This viewpoint is nice for looking into Romsdalen as well as to the steep cliffs both south and north. As we reached the bottom of the north-west ridge (about 1 kilometer before the 1536 meter viewpoint), we continued up along this ridge. The route is nice and one can stay at the very top of the ridge all the way, nice scrambling on good rock. We arrived at the summit, a spectacular viewpoint, by 1005. The weather was perhaps even hotter than yesterday. We rested about 45 minutes before heading back down. We decided to descend on snow, this worked well, but the slope (with rocks below it!) is steep enough that we would not have attempted this without an ice axe. Returning to the car by 1300, about 6 hours altogether. This trip had come to an end, as I needed to be in my office on Friday. We had a very warm and nice drive back to Bergen, arriving there a bit before 2200. Many thanks a re due to Pål Jørgen for good company along the route. We started around 0930, from a small parking next to the road a short distance up from the Trollstigen tourist complex. We hiked on a nice and well marked path in Alnesdalen valley until the lake Børtjønnaa, 1071 meter. From here, ascending the slope to arrive at Mannen (1294 meter). 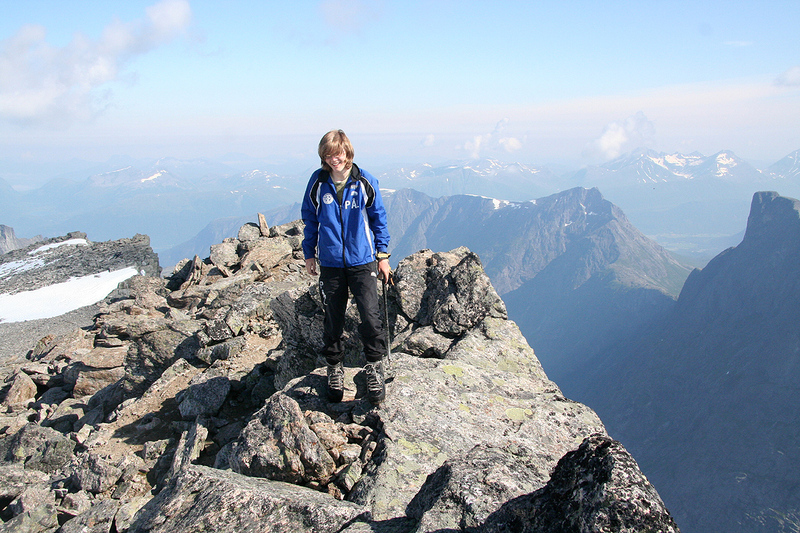 At the summit, Pål Jørgen is watching his steps. 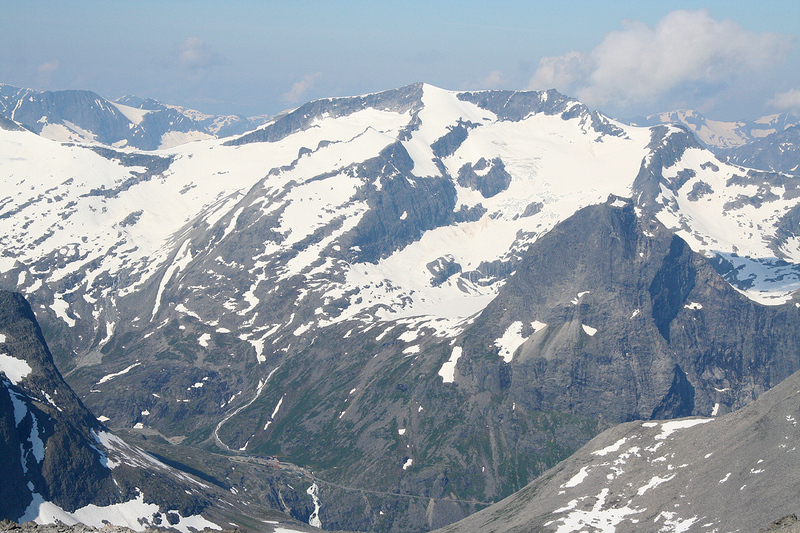 Summit view, straight down into Romsdalen. The summit cliff, a mile down from here..
Bispen and Kongen, as seen from the route to Breitinden..
Finnan, as seen from Breitinden..